Mystic poet and saint Kabir is believed to have lived in and around Varanasi in the 17th century. He wove the sheet so fine. Kabir here isn’t talking about a piece of cloth that is being woven. It takes nine months for a human life to be created and why are we He is asking us why are we treating ourselves, our lives and or bodies so gross? He asks. His question was relevant in 17th century and it is relevant now. Sharmistha Dutta ponders over this question in Kabir’s poem through her photographs of the life of weavers around Varanasi. She asks while they weaves sarees so exquisite, why is their life so hard? Why do they earn so little? Click here to listen to rendition of this song by Dhrupad exponents – Gundecha brothers. In a country where sari is the mainstay for more than half the womenfolk, Varanasi silk holds its pride of place firmly. 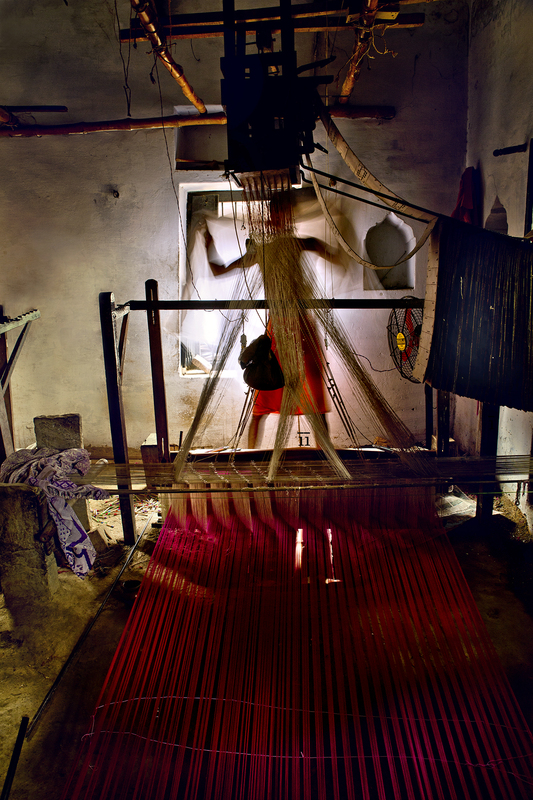 Every family in India has at least one Varanasi silk sari that has been passed down through generations. It has stood the test of time owing to the supreme craftsmanship and intense labor that has gone into its making. Its sheer beauty and richness has attracted many a patron from all over the world, besides of course the indigenous buyers. The art of silk weaving in Varanasi is hundreds of years old and the city is home to thousands of weavers whose lives revolve around the craft. For generations the weavers have been using the hand looms to weave saris and needless to say that its an extremely laborious and painstaking process. A sari might typically take 7-14 days to make, starting from procuring the silk threads, dyeing, drying and powdering the threads to ultimately weaving the entire six yards on the hand loom. The story of course does not end here. Many a times the sari is dyed after its woven and then it also goes through various printing process, whether its block printing, silkscreen or even digital printing, depending on the demand of design. Next it reaches the market through the trader, distributor and most importantly the numerous designers. Perhaps this where the sari saga takes another leap, another dimension, before it reaches the ultimate buyer. From the humble and yet complex, dark ghettos of the weavers, the sari has travelled an entire labyrinth and is now ready to be exposed to the pomp and glory of a dazzling designer showroom. And of course its cost too has increased some thousand times by now. Its sheer irony that the hand loom weaver is not a witness to its present avatar. He of course, remains in his dark ghetto, surrounded by darkness, lit only by a humble bulb, hanging from the top. Its purpose is to just illuminate his immediate surroundings, so that he can now toil on the next six yards. 65 year old Sardar Hafizullah has been weaving saris on hand loom for the last 40 years, just like his forefathers who have been into the craft for more than 250 years. About a decade ago there were almost 1,00,000 hand looms in Varanasi compared to the current figure of 40,000. Many sit idle, in need of repair. Only a handful of old weavers who have seen generations before them doing he same thing, choose to stick to the craft. Of course it’s also a matter of compulsion, as they do not have any other skills of earning a livelihood. On an average a weaver earns a meager 200 rupees for working 8-9 hours a day, 30 days a month. Its a paltry sum and is often not enough to cover his daily expenses, feeding and supporting his family. Poverty, health issues, lack of facilities run deep in such communities. This is a major reason why the present generation is choosing other means of livelihood, agriculture or even daily wage earning as migrants in cities. They are also shifting to power looms and mechanization of sari weaving, wherein they get to earn 500 rupees per day, which is more than double of what hand loom weavers earn. The quality of the sari of course takes a hit here, as a produce of the power loom can never come close to the sheer quality and richness of a sari made on hand loom. But the cost tends to come down drastically and many buyers are willing to compromise on quality. Cheap fabric from China has also proved to be a major contributor to the sad situation. However every cloud does come with a silver lining. In the face of major apathy of the government, which never did anything to improve the worsening condition, several NGOs and welfare organizations like AIACA and VWAS stepped in to improve the lives of the weavers and thereby gave a fresh lease of life to the dying art of hand loom weaving. These NGOs have adopted several weaving communities, settled in the villages of Kotwa and Lohta, barely 40 km away from Varanasi. Incidentally both villages have majority of Muslim weavers. Their immediate needs, medical treatments, welfare and even regularization of wages is now looked after. Last but not the least, they are now given training on marketing their products locally, as well as to a bigger market. This is quite a huge step in the right direction and it facilitates their direct interaction with the real buyers, thereby giving them an opportunity to earn a fairer price for all the hard work they put in. Some of the weavers have become quite tech savvy with some amount of exposure through social media as well. That said, much more needs to be done to ensure that the age-old art of handloom weaving never faces extinction in the face of random modernization.